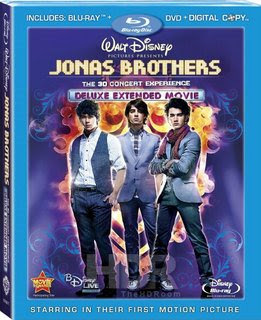 Making an early alert to retailers, Disney has set a late-June bow for the Jonas Brothers big screen musical epic 'The 3-D Concert Experience' to Blu-ray in late-June. Following a brief theatrical run earlier this year and a box office take north of $30 million, Jonas Brothers: The 3-D Concert Experience will hit Blu-ray on June 30, day-and-date with the DVD. Suggested retail price for the Blu-ray has been set at $44.95. Will you buy is for $44.95?